Un grupo de 13 torres de piedra que coronan la ladera de una montaña costera en Perú forman el observatorio solar más antiguo del hemisferio occidental, dijeron el jueves investigadores. El emplazamiento de 2.300 años de antigüedad remite a una sofisticada cultura que usó el espectacular alineamiento del sol y las estructuras para efectos políticos y ceremoniales, agregaron. El lugar, denominado las Trece Torres de Chankillo, abarca con precisión los arcos anuales de salida y puesta del sol, cuando se les ve desde dos puntos de observación especialmente construidos para tal fin. "Miles de personas podrían haberse reunido para observar impresionantes eventos solares. Estos acontecimientos podrían haber sido manipulados por una agenda política", dijo Ivan Ghezzi, quien hizo el descubrimiento mientras era estudiante de la Universidad de Yale. Por ejemplo, durante la época del solsticio de verano en junio, el día más largo del año, el sol sale justo a la izquierda de la torre más septentrional, explicó Ghezzi, que ahora es el director arqueológico del Instituto Nacional de Cultura de Perú, en una entrevista telefónica. Chankillo es un extenso centro ceremonial de varios kilómetros cuadrados. Tiene una estructura bien fortificada en la cima de la colina, gruesos muros y parapetos. Pero nadie había entendido la presencia de una hilera de torres a lo largo de 300 metros, colocadas en una colina cercana, como espinas en la espalda de un dragón. En un artículo en la revista "Science", Ghezzi y sus colegas dijeron que lo comprendieron. "Desde el siglo XIX se especulaba con que la fila de 13 torres podría ser una demarcación lunar, pero nadie siguió esa pista", dijo Ghezzi, quien decidió probar la idea mientras estudiaba estructuras militares en el lugar, que datan del siglo IV antes de Cristo. Existen muchas evidencias que demuestran que los Incas usaron los movimientos del sol para demostraciones de poder con fines políticos. ANCIENT SOLAR OBSERVATORY: The thirteen towers of Chankillo may constitute the oldest solar observatory in the Americas. Standing atop a hill in coastal Peru, the 2,300-year-old citadel is evidence that Sun cults predated the Incas by two millennia, researchers report in this weeks Science. When viewed from two observation points, the towers measure the annual rising and setting arcs of the sun with near-perfect accuracy. WASHINGTON (AFP) - Thirteen towers aligned on a hill in Peru are the remains of a 2,300-year-old solar observatory and calendar, which pre-dates even the Inca civilization, according to a study published Thursday. The walled, hilltop Chankillo ruins, some 400 kilometers (250 miles) north of Lima, have long puzzled scientists, says the study published in the March 2 edition of the US review Science. But Peruvian archeologist Ivan Ghezzi and his British colleague Clive Ruggles now believe that the sequence of towers erected between 200 and 300 BC "marked the summer and winter solstices" and that Chankillo "was in part a solar observatory." The towers "are built north-to-south on a hill in the center of the complex. Sites to the east and west are adorned with known relics of sacrificial material and were likely observing locations. "From these sites, the towers mark the annual rising and setting arcs of the sun. They also serve as a calendar accurate to within a few days," Science reported. The towers were evidence of earlier sophisticated sun cults than the Incans which were known to be carrying out studies of the sun some 1,500 years ago, it added. Archeologists from Yale and the University of Leicester have identified an ancient solar observatory at Chankillo, Peru as the oldest in the Americas with alignments covering the entire solar year, according to an article in the March 2 issue of Science. Recorded accounts from the 16th century A.D. detail practices of state-regulated sun worship during Inca times, and related social and cosmological beliefs. These speak of towers being used to mark the rising or setting position of the sun at certain times in the year, but no trace of the towers has ever been found. This paper reports the earliest structures that support those writings. At Chankillo, not only were there towers marking the suns position throughout the year, but they remain in place, and the site was constructed much earlier  in approximately the 4th century B.C. "Archaeological research in Peru is constantly pushing back the origins of civilization in the Americas," said Ivan Ghezzi, a graduate student in the department of Anthropology at Yale University and lead author of the paper. 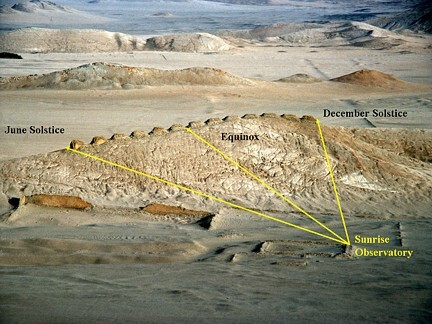 "In this case, the 2,300 year old solar observatory at Chankillo is the earliest such structure identified and unlike all other sites contains alignments that cover the entire solar year. It predates the European conquests by 1,800 years and even precedes, by about 500 years, the monuments of similar purpose constructed by the Mayans in Central America." 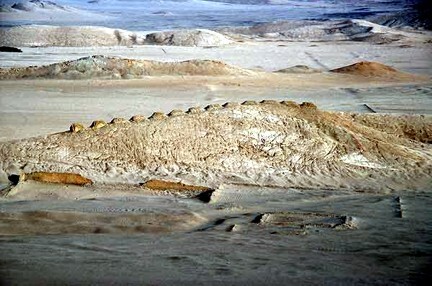 Chankillo is a large ceremonial center covering several square kilometers in the costal Peruvian desert. It was better known in the past for a heavily fortified hilltop structure with massive walls, restricted gates, and parapets. For many years, there has been a controversy as to whether this part of Chankillo was a fort or a ceremonial center. But the purpose of a 300meter long line of Thirteen Towers lying along a small hill nearby had remained a mystery.. The new evidence now identifies it as a solar observatory. When viewed from two specially constructed observing points, the thirteen towers are strikingly visible on the horizon, resembling large prehistoric teeth. Around the observing points are spaces where artifacts indicate that ritual gatherings were held. The current report offers strong evidence for an additional use of the site at Chankillo  as a solar observatory. It is remarkable as the earliest known complete solar observatory in the Americas that defines all the major aspects of the solar year. "Focusing on the Andes and the Incan empire, we have known for decades from archeological artifacts and documents that they practiced what is called solar horizon astronomy, which uses the rising and setting positions of the sun in the horizon to determine the time of the year," said Ghezzi. "We knew that Inca practices of astronomy were very sophisticated and that they used buildings as a form of "landscape timekeeping" to mark the positions of the sun on key dates of the year, but we did not know that these practices were so old." 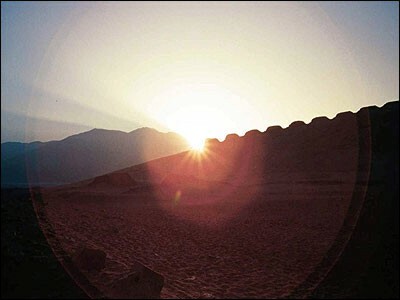 According to archival texts, "sun pillars" standing on the horizon near Cusco were used to mark planting times and regulate seasonal observances, but have vanished and their precise location remains unknown. In this report, the model of Inca astronomy, based almost exclusively in the texts, is fleshed out with a wealth of archaeological and archaeo-astronomical evidence. Ghezzi was originally working at the site as a Yale graduate student conducting thesis work on ancient warfare in the region, with a focus on the fortress at the site. Noting the configuration of 13 monuments, in 2001, Ghezzi wondered about a proposed relationship to astronomy. "Since the 19th century there was speculation that the 13-tower array could be solar or lunar demarcation  but no one followed up on it," Ghezzi said. "We were there. We had extraordinary support from the Peruvian Government, Earthwatch and Yale University. So we said, Lets study it while we are here!"
To his great surprise, within hours they had measurements indicating that one tower aligned with the June solstice and another with the December solstice. But, it took several years of fieldwork to date the structures and demonstrate the intentionality of the alignments. In 2005, Ghezzi connected with co-author Clive Ruggles, a leading British authority on archeoastronomy. Ruggles was immediately impressed with the monument structures. "I am used to being disappointed when visiting places people claim to be ancient astronomical observatories." said Ruggles. "Since everything must point somewhere and there are a great many promising astronomical targets, the evidence  when you look at it objectively  turns out all too often to be completely unconvincing." "Chankillo, on the other hand, provided a complete set of horizon markers  the Thirteen Towers  and two unique and indisputable observation points," Ruggles said. "The fact that, as seen from these two points, the towers just span the solar rising and setting arcs provides the clearest possible indication that they were built specifically to facilitate sunrise and sunset observations throughout the seasonal year." What they found at Chankillo was much more than the archival records had indicated. "Chankillo reflects well-developed astronomical principles, which suggests the original forms of astronomy must be quite older," said Ghezzi, who is also the is Director of Archaeology of the National Institute of Culture in Lima, Peru. The researchers also knew that Inca astronomical practices in much later times were intimately linked to the political operations of the Inca king, who considered himself an offspring of the sun. Finding this observatory revealed a much older precursor where calendrical observances may well have helped to support the social and political hierarchy. They suggest that this is the earliest unequivocal evidence, not only in the Andes but in all the Americas, of a monument built to track the movement of the sun throughout the year as part of a cultural landscape. According to the authors, these monuments were statements about how the society was organized; about who had power, and who did not. The people who controlled these monuments "controlled" the movement of the sun. The authors pose that this knowledge could have been translated into the very powerful political and ideological statement, "See, I control the sun!" "This study brings a new significance to an old site," said Richard Burger, Chairman of Archeological Studies at Yale and Ghezzis graduate mentor. "It is a wonderful discovery and an important milestone in Andean observations of this site that people have been arguing over for a hundred years." 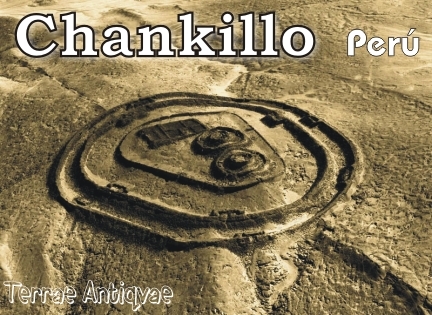 "Chankillo is one of the most exciting archaeoastronomical sites I have come across," said Ruggles. "It seems extraordinary that an ancient astronomical device as clear as this could have remained undiscovered for so long." 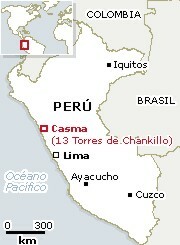 About 400 kilometers (250 miles) north of Lima, Peru, lies an enigmatic, 2,300-year-old ruin named Chankillo. Archaeologists have nicknamed the ruins central complex the Norelco ruin based on its resemblance to a modern electric shaver. The buildings true purpose long eluded them. Its thick walls and hilltop location suggested it was a fort, but why, researchers wondered, would anybody build a fort with so many gates and without a water source? Then in March 2007, two researchers, Ivan Ghezzi and Clive Ruggles, offered an explanation for the complex: at least part of it was a solar observatory. 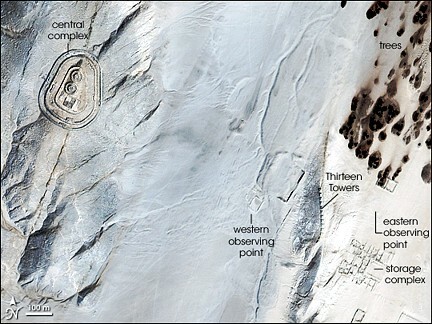 GeoEyes IKONOS sensor captured this image of Chankillo on January 13, 2002, and this picture shows the features the archaeologists studied to infer the sites purpose. The central complex appears in the upper left with its concentric rings of fortified walls. Southeast of the central complex are the Thirteen Towers, which vaguely resemble a slightly curved spine. On either side of the towers are observing points (little is left of the eastern observation structure), and south of the eastern observing point is another building complex, apparently used in part for food storage. Although the dark shapes in the northeast seem like rock outcrops, the higher-resolution image reveals they are probably trees. The Thirteen Towers were the key to the scientists conclusion that the site was a solar observatory. These regularly spaced towers line up along a hill, separated by about 5 meters (16 feet). The towers are easily seen from Chankillos central complex, but the views of these towers from the eastern and western observing points are especially illuminating. These viewpoints are situated so that, on the winter and summer solstices, the sunrises and sunsets line up with the towers at either end of the line. Other solar events, such as the rising and setting of the Sun at the mid-points between the solstices, were aligned with different towers. Why did the ancient inhabitants of this region cultivate such a thorough understanding of solar cycles? In addition to potential ceremonial purposes, the observatory may have had practical uses as well. In Perus dry coastal reason, precipitation is seasonal, so a reliable solar calendar would help determine the optimal time to plant crops. Mann, C. C. (2007). Mystery Towers in Peru Are an Ancient Solar Calendar. Science. 315: 1206-1207. Ghezzi, I., and Ruggles, C. (2007). 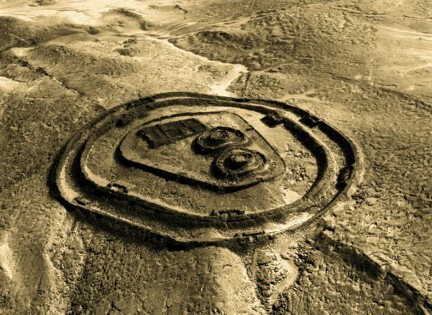 Chankillo: A 2300-Year-Old Solar Observatory in Coastal Peru. Science. 315: 1239-1243. Image copyright GeoEye/SIME. es bueno estar informado sobre estos hallasgos que se se dan en nuestro territorio. si el gobierno pondria mas atencion a la ciencia y tecnologia que tuviron los antiguos peruanos no estariamos en la miseria.